The drinking age onboard a cruise ship is typically 21 for cruise lines catering to Americans or for ships cruising to or from U.S. ports. European lines and a few American lines decrease the drinking age to 18 in Europe and other non-U.S. destinations. Underage drinking is taken seriously, and cruise ship staff have the right to disembark both the minor and the adult who bought them a drink if they're caught. To find out your cruise ship's restrictions, see our story on cruise line alcohol policies. Where can I buy drinks onboard? You can purchase alcohol -- wine, beer, cocktails and liquor -- in cruise ship restaurants (including the buffet), at bars, from roving waiters on the pool deck and in the theater before onboard shows, via room service and from in-cabin mini-bars. 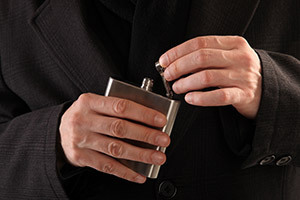 In general, passengers are permitted to drink pretty much anywhere and can take a drink from a bar and walk with it to their cabin or other onboard location. That said, most cruises are not drunken booze fests. You might come across someone who has had a few too many, but the majority of passengers will be well behaved. How much are drinks on a cruise? On most cruise lines' ships, alcoholic drinks cost extra and incur an automatic 15 to 18 percent service fee. Pricing will vary by line, but it's akin to restaurant and nicer bar prices -- about $12 per cocktail, $6 to $8 per glass of house wine, $10 to $12 for nicer wines. Some luxury ships include most or all alcohol in their cruise fares; sometimes the most premium brands cost extra. What kind of drink choices do I have? Bars usually have drink menus, but you can always ask the bartender to make you something off-menu. If you have specific off-menu drink in mind, be savvy about which bar you approach; the pool bartenders will specialize in frozen drinks, the martini bartenders will know more about craft cocktails, and the wine bartenders will have a larger selection of vintages available. Ships do carry low-end and top-shelf liquor, but brands will vary by ship and by bar. Beer choices tend to be basic, except on ships with pubs or bars that specialize in beer. Bar staff will try their best to accommodate, but onboard bars are never going to compete with trendy land-based establishments. Do I have an in-cabin bar, or can I have drinks in my cabin? Some cruise lines include in-cabin bar setups for all passengers (luxury) or in the top suites (mainstream). If you're not given a bar setup, you may be able to purchase bottles of wine or liquor through your ship's gift shop to be delivered to your cabin on your arrival. 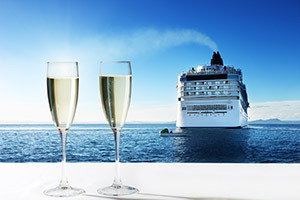 Your cabin attendant can supply you with ice, glasses and a corkscrew if they're not in your cabin already; however, on non-luxury ships, you'll be required to pay for mixers like juice and tonic water. Do I have to finish my bottle of wine in one sitting? Cruise lines employ sommeliers in the main restaurants to help you choose the perfect wine for your meal. If you wish to order a bottle of wine, you're not required to finish it in one sitting. Just ask your waiter to cork it and save it for you, and you can access it from any restaurant on a subsequent day. How can I save money on my drink purchases? 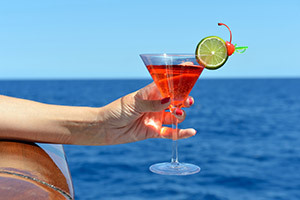 If you plan on ordering many beverages (alcoholic or not) onboard, you might save money by purchasing a drink package, offered by many cruise lines. Learn more about all-you-can-drink packages in our story. Can I bring alcohol on a cruise with me? Cruise lines are strict about the kinds of alcoholic beverages passengers can bring onboard, either at embarkation or from a port of call. Find your line's alcohol policies in our story. How can I learn more about alcoholic drinks on my ship?